Yes! 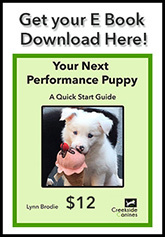 Your dog can do that! Only 6 minutes from I-40 & 421 convenient to Greensboro, Winston Salem,Oak Ridge and surrounding areas in the Piedmont Triad. 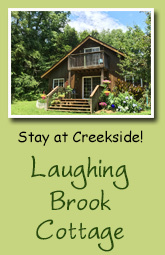 Nestled on just under 10 acres, Creekside Canines is a unique dog training facility in a gorgeous park-like setting. 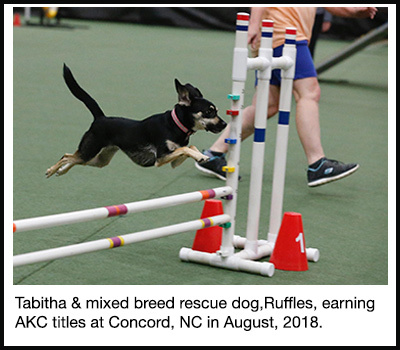 Classes for fun and for competition. Private lessons at your convenience. 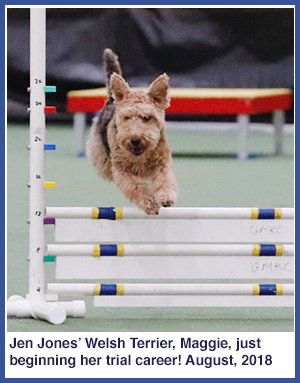 Fully fenced grass agility meadow with standard course area and jumpers course area. 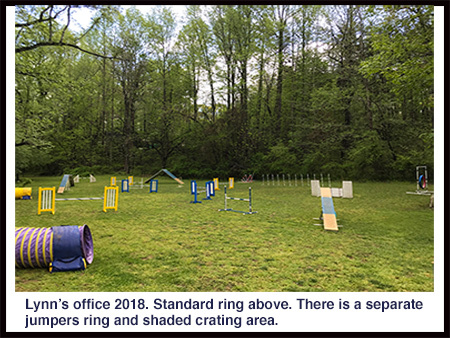 The agility meadow is quite large with both a standard course area and a jumpers course area. The creek is to the left and there is a shady area for crating to the right. It is lighted for night time use as well.The meadow has terrific drainage so even after a rain, it usually may be used quickly. The equipment is state of the art for the safety of your dog including rubberized contacts and a breakaway tire (AKC specs). We have the new AKC table heights as well! 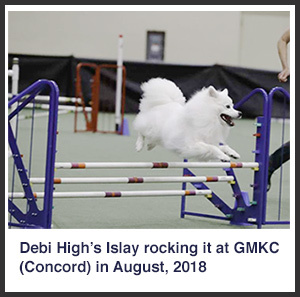 Most obstacles have both AKC and USDAA jump heights. Our jumps (and cups) are all pvc for the utmost in safety. NO METAL JUMPS. When the weather turns ugly, or we need a smaller confined training area, we turn to our indoor training area pictured below. 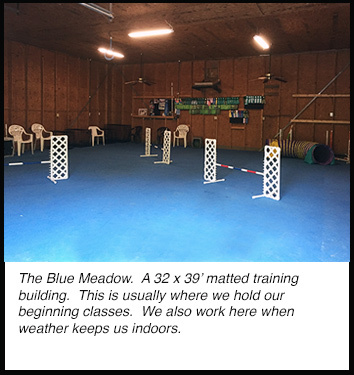 The building is fully matted and we've come to affectionately call it "The Blue Meadow." 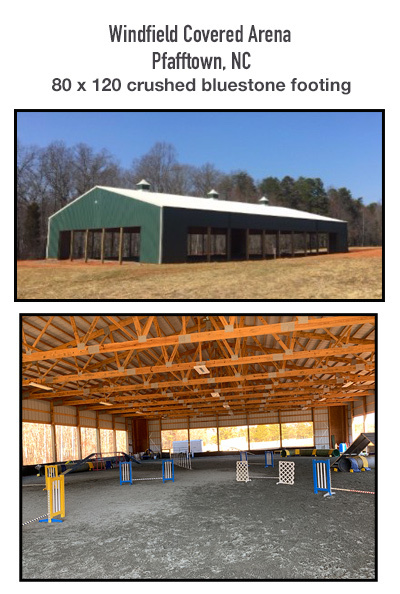 We also have the option of moving classes to the fabulous Windfield Covered Arena in Pfafftown (pictured below) when weather is bad and we need a full size ring. 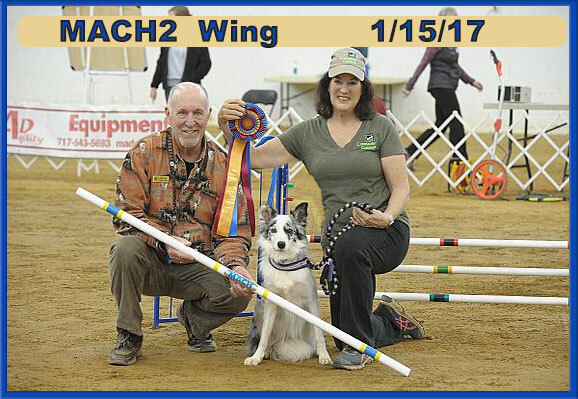 This is also great for dogs who are getting ready to compete and need to work in other locations and on different equipment.